The days following a disruptive weather event can be a confusing mix, emotionally. The threat has lifted and calm ensues, but the anxiety adrenaline hangover lingers. We are lucky to have dodged any significant damage or loss of power, but the multiple inches of dirty snow/slush, speckled with innumerable broken branches, delay the feeling of relief we seek. Thank goodness for our hills and valleys that break up the wind around here. The open terrain to the west didn’t protect the overexposed, iced up power poles lining roadways. We don’t have anything near that level of clean up facing us. That must have been a real shocker to come upon. Some of the local hunters stopped by for permission to cross our property with their dogs in search of coyotes. A short time later, gunshots rang out. 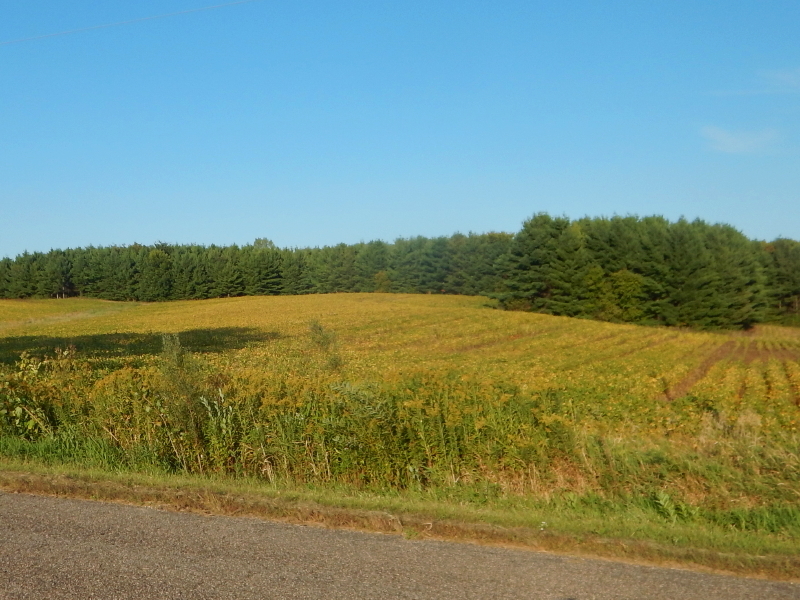 I had watched as the group of hounds calmly traveled out of the neighboring corn field and into the woods, with a single hunter walking behind them. After they disappeared into the ravine beyond our property, we never saw another glimpse of them. One of these days, I’m going to ask if I can tag along. It occurred to me yesterday, that in all our years here, I have never actually seen a coyote. I’m curious about the logistics of how they finally get proximity to shoot, and then how they find their way out of the woods while carrying their kill. In less than three weeks, our annual participation in the World Labyrinth Day peace walk will be upon us. We are finding it difficult to envision how we might be ready. It’s not just the peace pole that can’t stand up in the soft earth. 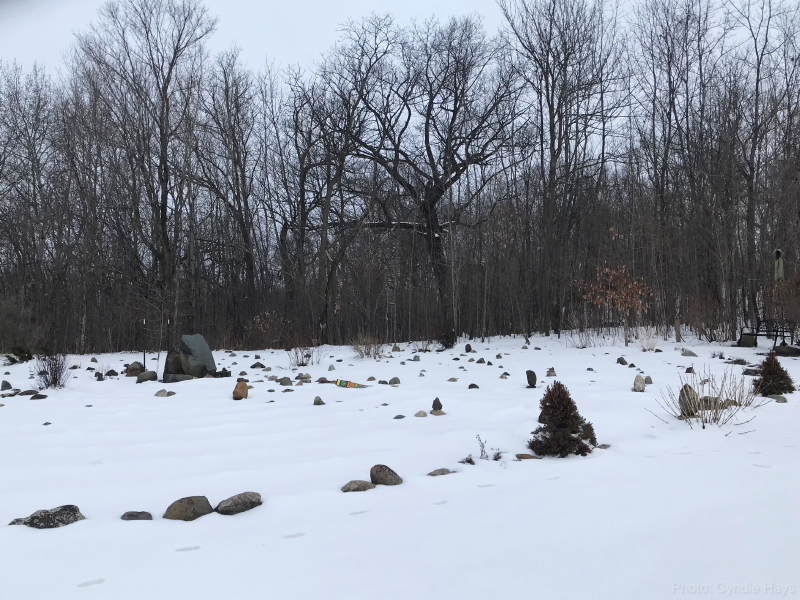 The stones balanced at each turn spend more time toppled that upright with all the freezing and thawing going on. Our exercise may just be to claim our peace with accepting things just as they are. Windy, calm; wet, or dry. Preparations are underway for our trip with Cyndie’s family to the Dominican Republic. I’ve been enjoying creating the early posts in the series I have planned to explore events that led up to this latest adventure, starting way back with the first time I met Cyndie. To give myself more time for planning and packing, I have decided to begin the series tomorrow. I hope you enjoy my trips down memory lane. I will take advantage of the early break from daily posting to finish making lists and actually start packing. Sounds like we will be getting away at a good time, as temperatures are expected to drop precipitously in the days ahead. 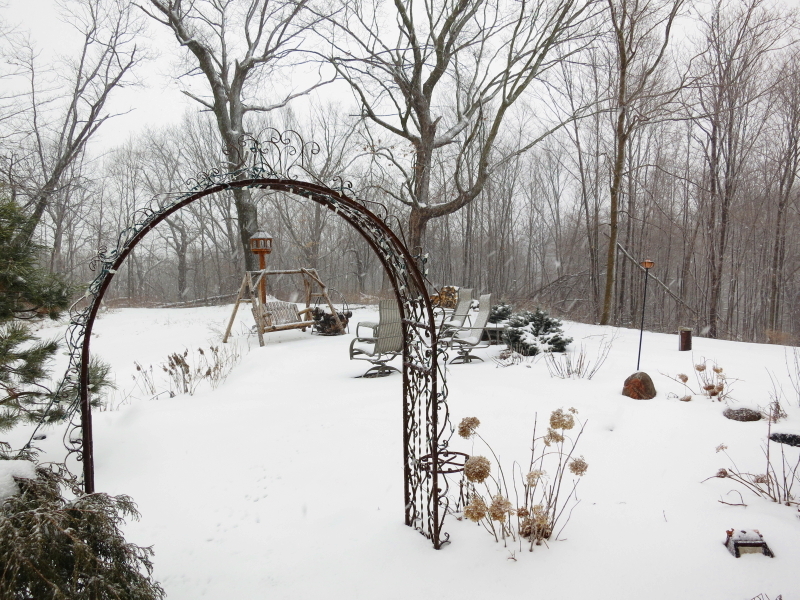 I’m hoping that it won’t snow enough to require plowing until after we return, but it’s okay with me if the cold snap happens while I’m gone. There was a little extra excitement around the ranch yesterday as the neighbor on our southwest corner reported he was going to be hunting coyotes and might cross our property. 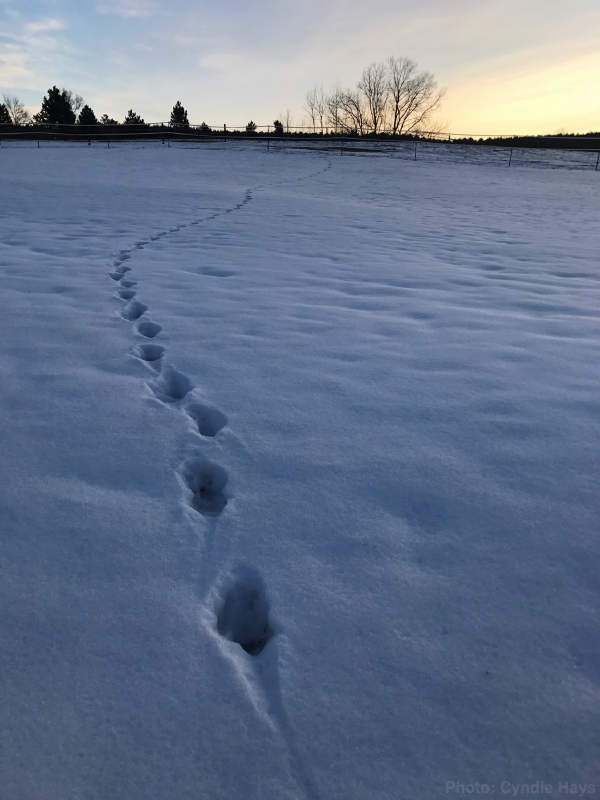 Early in the morning, Cyndie came upon some lone tracks in the snow that just might have been those of a coyote scout venturing out on its own overnight. If our neighbor is worried about his cows, I wonder if we should be concerned for our surviving three chickens. We are really hoping the young woman who has agreed to take care of our animals while we are away won’t have any difficult problems to manage. It’s just seven days. One week. Is that too much to wish for? An entire week at Christmastime of calm and quiet? I need to go find my battery charger for the camera. When we get back, I’m going to want to post lots of pictures of the tropical beach, palm trees, sun, and surf. I hope you’ll be entertained by the stories I have scheduled to post while we are gone. I intend to return to live, daily posting by the end of the month. Eventually, all the clues began to make sense. Not a day goes by that Delilah doesn’t find something outside our windows that drives her into a barking frenzy. Nine times out of ten, it is beyond me to identify what has triggered her reaction. If it’s squirrels, they are long gone by the time I arrive. If it is gunshots or thunder, she hears it long before I am able. Yesterday, Delilah began to go nuts with the barking. Attempts to distract and calm her seemed futile. Minutes later, Elysa and Anne stepped in the door announcing their arrival for a visit. Was Delilah barking at them? I was willing to believe it. As the afternoon wore on, we headed outside to spend some time with the horses. We found them uncharacteristically jumpy. I tried several times to brush the remaining snow off their backs, but not one of them stood still long enough for me to finish. The wind was gusting a bit, so we thought maybe that was making them uneasy. It gave us an excuse to move on toward the pasture to toss discs for Delilah to chase. Out in the open, the wind was cold enough to drive us onward so we headed for the trail in the woods. I had already traveled this trail earlier in the day with Delilah when we did our usual morning patrol after feeding the horses. We had enough snow overnight to just cover the ground, so it was easy to spot recent tracks along the trail. There were very few at that earlier hour. As the four of us walked along with Delilah, it was easy to spot something laying on the trail up ahead. My first thought was that the wind had knocked down a tree branch, but what my eye was seeing looked larger than a typical fallen branch. It was the largest limb from a carcass that I had ever come upon. My guess: it was the leg of a cow and coyotes were likely to blame. Why one or more of them had dropped this leg in the middle of our trail is a mystery to me. Of course, it was a prize beyond Delilah’s wildest dream. 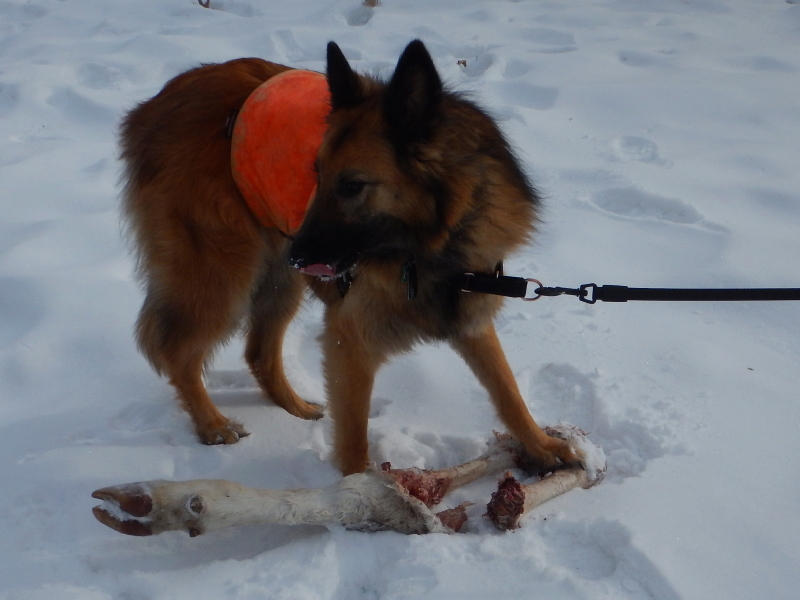 It was too much for her to carry, so I picked up the frozen leg and carried it for her. She didn’t know what to do. Walk in front of me? Walk behind me? Jump up and bite it while I walked? We made our way back to the house where I left it on the ground for her to gnaw on. She instantly morphed into one of the pack. Based on the size of this limb, I’m expecting to see the local coyote hunters busy at work around here in the near future. Farmers aren’t very patient when their livestock are being culled by predators. For those with sensitivities about such images, I am including this shot as a thumbnail to give readers an option of viewing it or not. Click per your personal tolerance for the gruesome, but natural, cycle of life involving wild carnivorous animals. Sunday was a refreshing day of warmth and sunshine, which melted enough snow to bring us almost back to where things were before last week’s storm. As I expected, much of my day yesterday involved shoveling channels in the muddy ground to facilitate drainage of the melt water. Luckily, we got help from Elysa and her friend, Anne, who stopped by for a dose of country sun and to commune with all our animals. 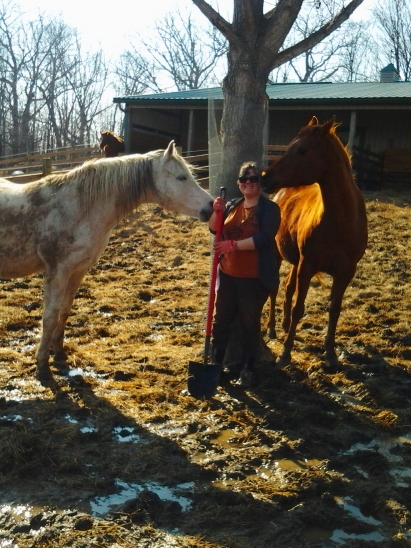 Anne captured this beautiful picture of Legacy and Cayenne giving Elysa some love for her efforts. In the morning, while Cyndie and I were working in the paddock, we spotted a local coyote hunter’s truck that had stopped on our road. Then I heard the baying sound of his hunting dogs and quickly became concerned about where Delilah was. We discovered her a little ways out in one of our fields, oblivious to the world as she buried her nose in the ground in pursuit of some enticing scent. We called her back to our vicinity. A short while after that, the sound of the hunting dogs erupted again, this time closer, from the woods beyond our house. Delilah took off after the sound, despite my calls for her to stay. Uneasy about what the hunting dogs might do to the sudden appearance of our dog, I dropped my shovel and hustled after her. Before I got very far, I heard the hunter’s truck coming up behind me in our driveway. He has been up to our house a couple other times, to ask permission to track coyotes across our property, so I was familiar with him. He assured me that Delilah was not at any risk from his dogs. Just then, she came sprinting back, now interested in this stranger standing with me. We visited briefly and then he checked his electronic tracker and found his pack of hounds had moved on, so he headed off down the road after them. You’d think by this point we might have considered putting Delilah on a leash, but we went on about our activity as if that whole hunting dog concern was over. That’s not the way tracking necessarily works. After enough time passed to lull me into forgetting about it, I happened to glance up and spot an animal running along our southern property border. Initially, I wondered if it might be a coyote on the run from the pursuit, but it became clear it was one of the hunting dogs. By the time I located Delilah, it was obvious that she had seen it, too, and was already on the opposite side of that same field. Despite both Cyndie’s and my protests, Delilah excitedly ran down to check on the new dogs visiting her turf. True to the hunter’s word, there were no threatening gestures from his pack, as the number of arriving dogs increased. What did end up happening was plenty of barking and eventually, confusion. With Delilah anxiously, but cautiously, trying to engage all these strange dogs, the pack seemed to lose track of their primary mission, and decided to focus all their attention on her. Delilah decided to retreat back toward us. Soon there were hounds around and in the paddocks and a fair amount of chaos as Cyndie and I hollered, waffling between trying to collar our dog or the hunting dog that was now in proximity of our horses. In a flash the hunter’s truck was rushing up our driveway, and he apologized three different times as he hoisted each of his dogs up into their compartments on the back of his truck. Happily, there were no problems that occurred from the close encounter between our dog and the hunting dogs. In fact, it turned out to be a great opportunity to increase awareness of Delilah to our surrounding community. The hunter happens to be a cousin of our neighbor whose property abuts ours on two sides. He approved of the orange vest we make her wear outside. He said he noticed her out in the field right away the first time he pulled over, and would make sure his cousin knows about her now, too. I appreciate that, because we’ve been meaning to introduce her since we brought her home last July, and just never got around to making it happen.